Michelle Obama's fashion is making history again, at least for the next year, as her second inaugural gown will be displayed at the Smithsonian Institution. Before it's stowed away for a future presidential library, Obama's ruby-colored chiffon gown made by designer Jason Wu is being lent to the National Museum of American History for a year to coincide with the 100th anniversary of the Smithsonian's first ladies exhibition. The dress will be paired with Obama's shoes, designed by Jimmy Choo, and will go on display beginning Tuesday. While the Smithsonian traditionally collects each first lady's first inaugural gown, second gowns are usually shown only in presidential libraries. This is the first time the museum has displayed a second inaugural gown. The dress was transferred to the National Archives but is being lent to the Smithsonian with the White House's blessing. Smithsonian Curator Lisa Kathleen Graddy said it seemed like a nice time to start a new tradition in the ever-evolving First Ladies exhibit for those who serve two terms in the White House. This dress drew headlines when Obama unveiled her selection one year ago. It was the second custom-made Jason Wu gown Obama had chosen, following the white gown Wu designed for the first lady when she arrived in Washington and on the fashion scene. Since then, Obama has become a trendsetter. The red gown is embellished with cut velvet that carries a unique shimmer, Graddy said. It features a cross-halter strap neckline, and the ring at the top is adorned with small diamonds. It's unusual for a first lady to use the same designer twice, at least in recent decades. Wu has said it's been the experience of his life to help dress the first lady, taking him from fashion insider to a household name since the first inauguration in 2009. Mrs. Obama also has turned to designer Thom Browne for special outfits, including her coat and dress for inauguration day in 2013. Even her outfits from J. Crew draw notice, and some of Obama's apparel choices sell out quickly online. 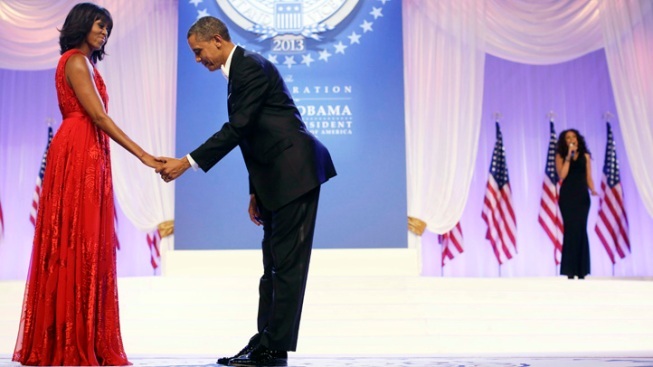 For 2014, Pantone Inc.'s color of the year - orchid, a shade of purple - was introduced with a nod to the fact it's a color Mrs. Obama often wears. Pantone sets color standards for the design industry. From time to time, the people want to copy the fashion of a first lady, Graddy said, noting Jacqueline Kennedy as an example. The Jimmy Choo shoes paired with Obama's second gown had a much shorter heel, seemingly more comfortable than her heels for the first inaugural, Graddy said. The first lady knew how long she would be on her feet for the second inauguration.